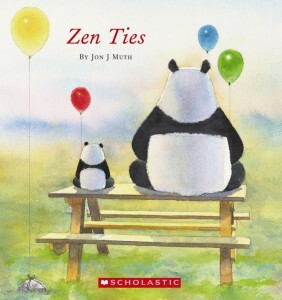 Jon J. Muth amuses and teaches again through the character of Stillwater the Zen panda in this second children’s book of Buddhist teachings. Just like in Zen Shorts, the giant panda is introduced by a child who notices a bear “sitting.” The watercolor illustrates Stillwater sitting Zazen in the traditional cross-legged Zen meditation pose. This time, Stillwater’s little panda nephew named Koo, arrives for a visit. The play on words continues as Stillwater greets him by saying “Hi, Koo” and Koo responds in haiku poems throughout the story. Addy, Michael, and Karl also appear in this book but now Michael is seeking sage advice from his friend Stillwater. And seemingly unrelated, the proactive panda, encourages the children to meet another neighbor, Miss Whitaker whom the children claim hates them and they protest that she’s “really old and she spits when she talks… and she shouts at us” and scares them. Stillwater encourages their compassion and tells them she is ill and needs something to eat. The story revolves around the evolving relationship with Miss Whitaker and several of the watercolor illustrations of her enhance her character and render more emotion than mere words. In helping a neighbor, the children learn from her and she from them. Although there are no historic parables in this book, Stillwater nevertheless manages to teach the children and adult an important life lesson through modeling and encouraging compassion and understanding. This story was a little more predictable than the first one but still enjoyable and meaningful. The watercolor illustrations continue to be detailed and interesting but there are several pages that are absolutely outstanding in their ability to express the emotions and describe the characters of the story wordlessly. Stillwater imparts another life lesson that is just as relevant to today’s children and adults.